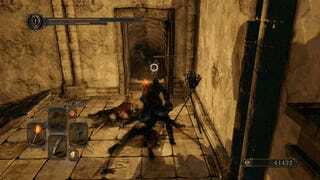 If you've been playing Dark Souls II, and following the coverage leading up to the game's release, you may have noticed that the version of Dark Souls II that was originally shown off to the public was not the same as the game we got on consoles. Tweaks to the lighting, overhauls in the structure of the game and graphical changes have been significant since the original gameplay reveal. The following post contains some images that could be considered spoilers. 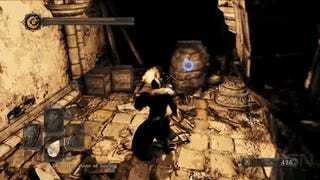 The torch system in Dark Souls II, as I played it in the E3 demo last year, sure did look gorgeous. The idea was that the game would feature a dynamic lighting system that would force players to carry a torch around certain areas just to see. Enemies and objects would have cast very harsh shadows. In retrospect, that could have also been a massive hassle. 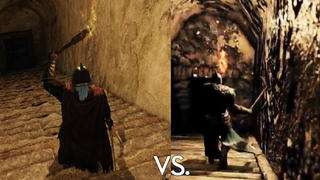 Lighting in the IGN gameplay reveal (April 11th, 2013) and the Playstation All Access demo (January 29th, 2014). Muted shadows in the final version. Granted, that might have been the point — force a player who would normally operate with a sword and shield to go one-handed, creating an additional level of dynamic difficulty. But that also means that the game would be punishing specific styles of play. What if you prefer to use the bow? What if you're a magic caster? What about people who dual-wield? The Souls series has never been about that, and potentially throwing the entire game balance out the window just to make it look cool wouldn't have been ideal. Dark Souls II, as it shipped for PS3 and Xbox 360, does not really require that of you. The blacks are less contrasty and while torches help against certain enemies and areas. They are not required to the extent of the original demo. You can get by without carrying a torch everywhere, and frankly, that's how it should be. 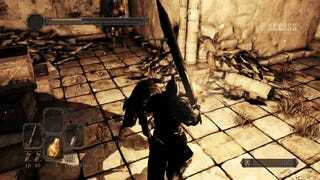 Half of the fun of Dark Souls is being able to parse out exactly where an enemy is, how far away they are. While it is a cute trick for certain areas of previous games (like Tomb of the Giants), I wouldn't want an entire Souls game that played like that. Also, the shadows as they were presented in the original demo could have been distracting when fighting enemies. A comparison between the original IGN reveal and the final version shipped. That said, the game does look massively different from what shipped. Changes beyond just the lighting are evident. Different textures and geometry seem to be present in the versions presented. You can read an entire thread of comparisons and speculation over at NeoGAF. It's worth noting that we still do not have the PC version of the game, which might be radically different than the console versions. We've reached out to Namco Bandai for comment about the apparent differences, and we'll let you know what, if anything they share about them.